This week I’m excited to send you an excerpt from my new book. You Can Create an Exceptional Life chronicles time spent with a woman whose work has been deeply influential in my life. As a matter of fact, Louise’s first book, You Can Heal Your Life, set me off on my own journey of self-discovery. Who knew I’d be writing a book with her more than 20 years later! Louise and I spent almost a year traveling throughout the US and abroad, speaking at events, teaching together, and enjoying quiet meals where we talked about everything from how to love yourself and your body, to the benefits of aging, and the simple, daily habits that will truly create an exceptional life. I hope you find yourself in the excerpt below—something you can identify with or a piece of wisdom that’s helpful. And, I hope you’ll pick up a copy and enjoy the journey with us! “We are powerful, creative beings who determine our future with every thought we think and every word we speak.” This was the first thing Louise said when I turned on the voice recorder at the start of our next session. We were sitting opposite each other, stretched out on a long window seat in my hotel room, overlooking the city of Toronto below. It was a beautiful, sunny afternoon. As I considered Louise’s remark, I realized that, at its core, this message is one of the most important: In our purest, most positive state of mind, we are powerful creators of our very best lives. When we think good thoughts, we feel good. When we feel good, we make good choices. When we feel good and make good choices, we draw more good experiences into our lives. It really is that simple . . . and elegant . . . and true. Science tells us that energy waves are the “stuff” of the Universe, and that every breath we take and every thought we think has a direct effect on something or someone in it. The chair I sit on, the keyboard I use to write, and the beautiful magnolia tree outside my window are all made of energy. The speed with which an object vibrates determines the density of the form. This energy is directly influenced by the thoughts we think, the words we speak, and the actions we take. These thoughts, words, and actions produce feelings; and our feelings become the currency with which we purchase our life experiences. As Louise and I talked about the ways in which our thoughts influence our lives, I became even more aware of how significant and powerful this concept really is. So much of what we both believe, teach, and practice in our own lives is based on a concept that is still seen by many as far-fetched, New Age, or simplistic at best. For a moment, as I transcribed these words onto paper, I felt compelled to search the web, my personal library, or the minds of my colleagues in the scientific community for solid evidence to back up our ideas. But I don’t do that anymore. I no longer defend the spiritual principles that have guided and shaped my life. They work and I know it. Louise and I both know it. As we continued our conversation, it became clear that Louise and I had each been inspired by New Thought writers such as Emmet Fox and Florence Shovel Shinn, who encouraged readers to use the power of thought to change and improve their lives. By applying these principles to our own lives, Louise and I have been able to manifest opportunities and experiences that we believe are proof of how powerful our thoughts can be. And this evidence has reinforced our beliefs. While science may ignore anecdotal evidence from people who experience the healing or creative power of thought, the stories are important. They are harbingers of change, catalysts for a shift in consciousness that will ultimately shape the way we live. Miraculous stories and extraordinary experiences often precede understanding. They invite us to open our hearts and minds so we can view the world in a new and different way. Then we’re better able to believe in something that existsoutside of our limited thinking. And that’s the point. Evolutionary leaps of consciousness often begin with ideas that seem magical or astounding. Just think about how crazy the idea of seeing images on a box in the living room must have sounded to people when they first heard about “television.” One wild, seemingly impossible idea changed the face of humanity forever. 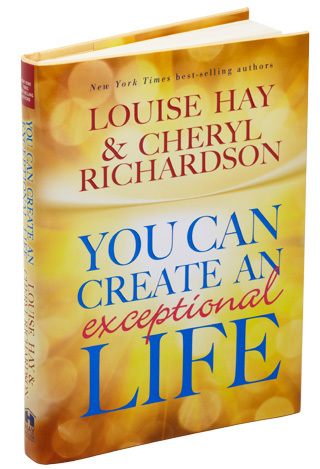 You can purchase “You Can Create An Exceptional Life” by Louise L. Hay and Cheryl Richardson here. ← You are worthy – Don’t block your power to manifest!